Silver Diamine Fluoride treatment for cavities. Tooth decay (cavities) are one of the most common health problems affecting children. Fluoride as a preventative measure is something we have all heard about since we were kids. Fluoridated water, toothpaste and mouth rinses are common in our society for standard protection of our teeth. Multiple, comprehensive studies have proven that fluoride reaps many positive benefits in the prevention of tooth decay. The addition of fluoride definitely gives our teeth an advantage in the fight against tooth decay. However, tooth decay can still occur. Standard methods of treatment over the years often include dental fillings, root canals or crowns. In recent years, new treatments like the use of Silver Diamine Fluoride (SDF), have taken root as alternatives to invasive methods traditionally used to treat tooth decay. Silver Diamine Fluoride is made up of two things: our trusted friend fluoride and silver. When teeth are developing the fluoride is incorporated into the enamel. That hard coating helps prevent tooth decay by building up a barrier against sugar, bacteria and plaque that wind up on our teeth. Even after our teeth are formed, the benefits of fluoride continue to be evident in the prevention of tooth decay. Silver is the second part of SDF. In this application, silver penetrates into and remains on the surface of dentin and/or enamel, acting as an anti-microbial agent. (Dentin is the underlying protective layer of our teeth.) The combination of silver and fluoride work to control active dental caries and prevent further progression of decay. 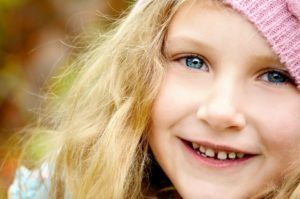 For children who have tooth decay, removing the decay and placing a restoration is often the common solution. However, the use of SDF is a non-invasive option to stop the decay and prevent further decline in the health of the tooth. Unlike regular fluoride treatments, SDF is only applied to the affected areas. Teeth are brushed and thoroughly cleaned before applying the SDF. It is a painless and quick procedure that can treat the current problem areas and also act preventatively against further decay. SDF application is recommended every 3-12 months. SDF is also recommended for special needs patients, or those children who are unable to sit for longer, more traditional cavity treatments. SDF can also alleviate dentin hypersensitivity. This tooth sensitivity can cause sharp pains in the teeth or along the gums that result from exposed dentin. What Are The Risks Of SDF? While a healthy tooth structure will not stain with the application of SDF, a decayed tooth will be permanently turned black when SDF is applied. However, the good news is that a stained tooth structure can be replaced with a restoration or a crown in the future. If SDF comes in contact with the skin or gums, a brown or white stain may appear that causes no harm, it cannot be washed off, and will disappear in 1-3 weeks. The professional dentists at Smile Surfers make every reasonable effort to ensure the success of SDF treatment. There is a risk that the procedure will not stop the decay. In that case, the tooth will require further treatment, such as repeated SDF treatments, place a filling or crown, root canal treatment or extraction. As with any other treatments, if you are allergic to silver ou should not be treated with SDF. The board-certified pediatric dentists at Smile Surfers will advise you if SDF is an option for your little surfer.Contact your local office today to schedule fall appointments.